What now feels like a life time ago back in the dim and distant past ,OK - not so dim and distant 1980s, I was a young apprentice engineer with my training and interests firmly focused on Hardware (micro electronics more specifically). In 1987 I made the bold step towards software engineering as a choice, since it seemed, back then, that software was the way forwards to creativity and new solutions for communications. Having "converted" to software engineering by way of a degree in Computer Science at Aberystwyth University, I then continued in that vain becoming a professional software engineer. I still didn't forget the electronics that got me started, and this combined with software engineering put this to good use as a telecommunications engineer. Moving through the heady days of Nortel Passport Frame Relay Switches, Cisco AGS and MGS routers and Cabletron hubs. For the telecoms engineers out there (like me), in my humble opinion (IMHO) SDN is the networking equivalent of softswitches? The OpenFlow API is what MEGACO/SIGTRAN is to soft-switching and the so-called Orchestration layer the Stored Program Control Logic from the switch fabric and routing fabric. The media gateway is the Hardware forwarding platform (L2 switch fabric being physical of logical vSwitch, Microsoft Network Virtualisation and Virtual Subnet Identifiers), not to mention MPLS enabled VPLS and the rest of the MPLS "family". "leveraging standard IT virtualization technology to consolidate many network equipment types onto industry standard, high-volume servers, switches and storage." This allows the economies of scale that the enterprise networks are gaining through "cloud compute" to the telco space, by implementing these traditionally custom hardware based elements (such as media gateways, firewalls, SBCs, Routers, CSCFs) in standard (commodity Servers) architecture servers and a hypervisor layer, utilising the same virtualisation tools which enable flexibility of deployment of these elements in more standard environment, enabling features such as live migration of network functions under failure, multiple instances of a network function on the same hardware elements, and more interestingly (from my perspective) the ability to create multiple instances belonging to different customers (or even carriers) on the same hardware platforms. Time to re-write the architecture rule book. SIP trunking - interesting how much is involved when you sit down and think! I've recently spent a little over 3 days working on a new set of training material on SIP Trunking as part of my Wraycastle work. It amazing how much you hold in your head about topics. It's only when you start to put "pen to paper" so to speak that you realise there's a lot more about a topic than you superficially had in the front of your mind. 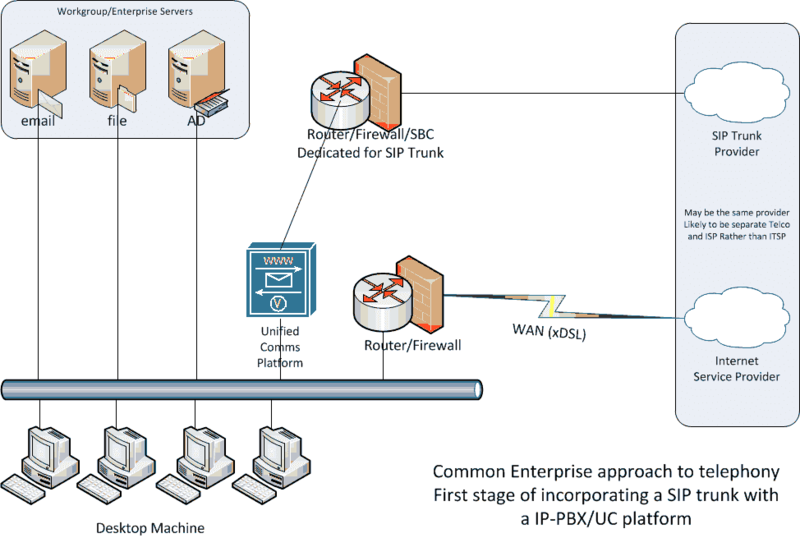 It turns out 33 slides later there is actually a great deal more than the SIP Forum's SIPConnect 1.1 specification when you start to consider all the facets of SIP trunks in their broadest sense, i.e. both Carrier to Carrier - Network to Network Interface (NNI) and Carrier to customer - User to Network Interface (UNI). Existing TDM PBX where the customer doesn't want to upgrade to a new IP-PBX, so chooses the media gateway route to terminate a carrier SIP interconnection with their TDM PBX. And Scenario two where a customer has invested in the IP-PBX or Unified comms platform and builds a separate network and connection for their voice infrastructure. WebRTC - LTE - Over The Top (OTT) services and disruption - or opportunity? I've recently been looking hard at IMS and LTE - as both these technologies are finally gaining traction in the market place with Carriers upgrading their networks to 4G with VoLTE to follow very soon - within a year or so for many. I've also been closely following the rapid rise of WebRTC and its deployment in browsers, Firefox and Google Chrome on you desktop now support WebRTC APIs and very soon it will be on your smartphone (http://googlechromereleases.blogspot.co.uk/2013/07/chrome-beta-for-android.html). Carrier vendors such as Genband and others are all ready with their implementations of App servers capable of providing WebRTC. More Interesting on this front as well is the recently announced Project Clearwater (http://www.projectclearwater.org/) IMS in the cloud. From the carriers perspective it might also be worth considering their position with respect to partnerships to enable OTT providers or deep packet inspection technologies to block the OTT vendors from utilising WebRTC applications. Partnership in my mind is better for both. It gives OTT providers the opportunity to get a QoS bearer service for their applications (QCI 5 and QCI 1 EPS Bearers) and potentially a custom APN to support this. For the Carriers innovation has not historically been a carrier's strength - partnership brings the opportunity to gain revenue from innovative services with little or no cost of development, and prevents them from the constant fear of becoming a bit-pipe provider only. Whilst thinking about QoS/QoE it also struck me that its going to be a bit more tricky (not impossible) for 3rd party QoS/QoE software probes to monitor the Quality of Web RTC traffic, on two counts, 1) its peer to peer - unless forced to be otherwise (media anchoring); 2) the media and RTCP is "munged" (technical term) together into a single UDP stream to improve on the chances of successful NAT traversal. And on a third count - the media may also be encrypted. VMWare of Microsoft HyperV - Free or Licenced? Whilst considering the design requirements of a hosted contact centre solution, one of the requests has been to consider which elements can be considered for virtualisation. The products in question for consideration are Oracle CallCallCenterAnywhere (CCA) and Cosmocom Call Universe (CCU). Oracle CCA is officially end of life and now in extended support from Oracle - this doesn't stop people using it though and both my self and a number of consultants are still supporting this platform, testament to the guys at Telephony@Work who created this great product and shame on Oracle for end-of-life for the product. Fix Pack 10 supports Windows server 2008 - 32 bit only officially however the small print in the release notes indicates the executables have been tested to run on 64-bit Linux. This means there at least is the potential to support both HyperV and VMWare hypervisors. That said the Cosmocom Call Universe product is now the only real alternative for multi-tenant host (Carrier scale) Contact Centre platform and thanks to the continued support and development fully support virtualisation. (footnote: I'm hoping for big things from Genesys Labs with their new cloud offering in this space). Both CCA's and CCU's architecture support redundancy in their design, which means technologies such as live migration/vmotion are redundant in some respects for per data centre availability. However with 2 data centres the option for "WAN" live migration opens up the potential for a higher availability of the elements. This point requires careful consideration of the options. Since the other options open to is is just databased replication across the WAN to keep items in sync. Having spent some time assessing VMWare vs. HyperV and product support of these hypervisors from Cosmocom - VMWare wins. Primarily on known to work on ESXi hypervisor, since CCU is currently only tested on Windows server 2008 with HyperV role. And secondary consideration is the footprint of the hypervisor with the the VMWare being a real light weight at around 512 Meg RAM! Wow... Its been a bit mad this year, since finishing a contract at News International, its been all go hitting the books again teaching with Wraycastle. I've spent February and March travelling back and forth to Holland, Southern Ireland and around the UK, teaching TCP/IP, VoIP/IMS and MPLS courses. I've been working hard upgrading my Cisco Lab and added 6 3725 routers, 2x 2950 switches (one which seems to be a survivor of a skip dump!) and a Cisco Catlyst 3550 layer 3 switch. This lab together with GNS3 and 8G RAM on my laptop and Mac Mini has helped me craft some pretty cool lab set-ups for demonstrating and teaching OSPF, BGP, MPLS, MPLS VPNs, Ethernet Over MPLS (and VPLS) and MPLS-TE. I'll get around to posting some lab work hopefully in the next couple of months.. One that would be great to get going Pseudo Wire carrying an E1 (30 channel) voice circuit.